John Stromquist represented WALDO which is the Westchester Academic Library Directors Organization. It is a multi-type consorutim, member driven, with library directors on the board. They focus on procurement. Incorporated, non-profit organization. All staff are contract staff and they have no physical office. They have 13 full members (who share an ILS), and 11 associate members (a shared union catalog). 400 limited members who are academic, and 400 plus public or special libraries. WALDO arranges for partnerships including 9 New York Regional Library councils along with Connecticut, Rhode Island systems and academic networks in New Hampshire and New Jersey. Provide overhead and management of procurement for members. Pass through all negotiated discounts. They add 5% administrative fee on the net price. There are 55 vendor contracts with over 1600 products. Annual growth over 25% ANNUALLY since 2000. John discussed the history of WALDO, which used the MnSCU PALS system and was hosted at Westchester County and then at Mankato State. It was user governed, librarian managed, and had source code access. Needed to leave Minnesota based system and had to create a new system. Old RFP system had massive meetings, choose a winner, and then try to negotiate a contract. So a new process was used. They assessed the marketplace for the top 2 or 3 vendors, interview current customers, and begin to negotiate contracts with top two vendors (ExLibris and Endeavor). Included provision to re-open negotiations with two years left (August 1, 2007). WALDO is completely uninterested in mastering technology. They have always purchased service. Negotiated a 5-year agreement. They began in January 2007 to look for a credible alternative to the current vendor. That is when they began to look at open source ILS including the Georgia PINES system. They created a set of service requirements. Functionality of current system needed to be maintained. It had to be hosted, full software maintenance, and applications, plus a 24 x 7 help desk. They then created a 4 person technical exploration committee. They started with LibLime (KohaZoom) and Equinox's Evergreen. They found some missing academic functions, but in other areas had more that what they currently had. John had some interesting perspectives on the legacy system vendors and the zero sum game which now exists in the library market place. He noted that III is the one financially sound legacy vendor. He wonders what will happen to the market as KohaZoom and Equinox get more market share. He outlined the full decision-making process. There was a detailed visit and process for looking at the system. They negotiated, and checked with other independent users on costs. Last month, they negotiated the final terms of the contract. On October 9, all concerned members agreed in writing to commit in principle. WALDO got fixed pricing terms over the 5 year period. No annual increases, including everything in the price book. One-time implementation charges were spread evenly over the term. One-time development could be spread over the first three years. New orders have a 5% annual cap. There is a complicated multiple volume discount. All costs are included: migration, start-up, training, hosting, etc. Some items are currently being developed by others, and even the ILL may be developed by someone else, and therefore even that money may be saved. "You have to hang loose." You have to support development. They have created an ongoing development fund. The funds collected may exceed a million dollars or more a year. 70% is earmarked for open source development, 25% earmarked for staff support, 5% is earmarked for training and education. The project is scheduled to be completed in summer 2008. St. John's University (the largest member) is willing to stick its neck out, and do the pilot production. LibLime has signed a hold harmless, walk away contract. As a vendor trying to get into the academic market. They expect that the final migration will occur in the fall of 2008 and spring of 2009. For the first three years of the contract, they will pay 20% of the one time implementation costs and 33% of one time development costs. Over the first three years, there is a break-even or minor savings. The savings in years 4-5 are 32% or more. After that the savings rise to 58%, for the largest library it is actually 88%. Tim Daniels of the Georgia Public Library Service talked about the origin of PINES. Part of the inspiration was a solution to the Y2K issues along with a dream of the Governor to have a single state-wide library card. It was developed, from scratch in just over two years. Has a large number of search features, clean look to the main page. Do allow customers to create own account and user name, plus change passwords. For all member libraries to replace PINES would be $15 million plus annual maintenance costs of $5 million/year. And the PINES budget is only $1.6 million. Got libraries to agree on a standardized set of policy rules. Jason Etheridge of Evergreen talked about some of the details. The current OPAC is the third version, and they are about to trash it for a fourth version. The current version has code on the main page which lets you add Evergreen to the search box choices of search engines in Firefox (and other browsers?). It is open source, and others are making changes, and contributing back to the community. He showed a search of a "meta-record" which had a single entry for all the various media types. Kind of like FRBR. He showed all kinds of records and examples and even the staff side of the system. Currently there is software which is resident, with much delivered over the web. They are moving to more web based. The bibliographic record is a consortium record, but there are ways to add meta-data including local notes. Local and volume notes are not added as part of the MARC record. Can't answer question about authority control, currently based on matching algorithms. First to present were Mike Bloomberg from Augsburg College and Katy Gabrio from Macalester College. The two colleges share a server, but have "different instances" on that server. Augsburg went live just before school started, and Macalester went live mid fall with a soft launch, and will begin promoting it with the next semester. The hardest part of the set up was deciding which databases to put in which groups. It was the meetings and getting the staff to agree on the grouping. The technical part was very easy. The trainer was there for a day and it was ready to go at the end of the visit -- from a technical end. There are few and fewer citation only databases, and more are full-text. Mcalester went live on October 1, and in the first three weeks, without publicity, data says 1,000 uses (which maybe should be divided by 6 for the six databases searched). Why chose? Ability to have "save my search" and "save my database" along with the ability to customize. Second to present was Suzanne Conboy from III who talked about Research Pro. She had trouble logging into the interfaces at various libraries because of authentication and firewall issues. It makes me wonder about how hard we make it for our patrons at times. She went back to Power Point to show what options are available. Carolyn DeLuca from the University of St. Thomas set up Serials Solutions (360 Search) at the beginning of the summer, and spent the summer tweaking the installation. There are a huge number of options for the pull down menu. They made their decision based on the fact that they are primarily serving undergraduates. The boxes are simply HTML which can be placed anywhere. They have over 300 databases, and tried not limit to the 75 most used. They kept access for the "native" searching primarily for the libarians. They took out the descriptions on the web page, and just added a clickable "i" icon which pulls up the description. It is a fairly clean looking product. Chose this product because it works well with the existing products and services which they already had. Faculty were happy to see it, but don't know if the faculty are using it, or if the students are. Individual students are often thrilled. There are no usage modules, and they only get statistics from the original data base vendors. Lindy Finifrock from Bethel University talked about WebFeat, where they have the Express version rather than the customizable version because of price. She showed their "Quick Search" which is a basic federated search. There are a limited number of choices for templates. Results appear as they are found, and you do not have to wait for the complete search to be completed. Can do relevancy ranking, and other sorting after the fact. I am at the Minnesota Innovative Users Group fall meeting at St. Olaf College. The first presentation was an III Corporate Update from Bill Easton, Customer Sales Consultant and Suzanne Conboy, eProducts Specialist. First to speak was Bill Easton. I was not life, so created these notes in Word and have pasted them here. What does Rock Solid mean? New Products developed: Circa – replacing the wireless workstation, inventory; can do quick check out, connected to server; Research Pro – replaces meta find federated search engine; Program Registration – calendar for programs and registration; Single Sign On – only have to sign on once (academic); Express Lane – self check; Article Reach – search and find articles and have them faxed (academic); Encore – starting to install, sold 70 systems so far; over 250 enhancements including printing and web management reports, new look and feel of client. Suzanne Conboy's presentation was on the variety of eResources available. Generally, these are staff tools. It can be used by the public as a discovery tool. So, they created a public web interface. You can use ERM to dynamically create information for web presentation. Use ERM to put much information in a single place. Examples: Cornell University “Find”; University of Colorado at Boulder [catalog = Chinook]; University of Arizona; Yale Law School; Leeds University; University of Queensland; Sonoma State University (California State University at Sonoma); Washington State University. Easy to implement: comes pre-installed with resource records, no need to manually enter; comes the training and Quick Start; includes database free for the first year (CASE); already live in 29 ARL Libraries, 200 other libraries. Actually, I don't really. But last night I went and heard Frank Warren, the author and complier of Post Secret. While the web site is incredible, and the books are great, if you get a chance, you should go hear him. It is an incredibly powerful presentation. There are more dates on the tour. The new book is A Lifetime of Secrets. Once I leave my meeting today, I will begin reading it. The ALA web site has announced that my friends Camila Alire and Linda Williams are running against each other for ALA President. They have also announced the list of ALA Council candidates. My list of endorsements will follow the close of petition nominations. It only takes 25 signatures to get on the ballot, and that is pretty easy to do at the Midwinter Meeting. More to follow! The conference is over, but the association web master (web mistress?) has created a page with links to many of the presentations. So, if you want to check my report, or read about a program I did not attend, you can visit the 2007 Conference Page of the WLA web site. Julie Fricke of Lawrence University (Appleton) did a great job of explaining mashups. 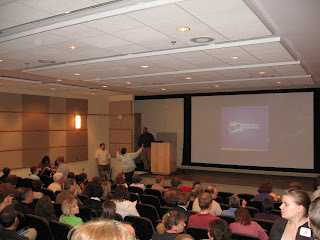 I was standing for the beginning, and the PowerPoint will be on the WLA Conference Web site. How do I make one: add this app (point & click...like Facebook, iGoogle); clone (Pipes); program (server side --to do some programming need to request and get a key). When is it OK to mix? Many have creative commons copyright licenses, but other have limitations (like Google Maps). What is the provenance (the Wikipedia problem)? What is its authority? How simple and what support will you get? Will there be upgrades? What happens with changes in software. Another interesting site is mashable.com (inlcudes news related to social networking software), can subscribe to an RSS feed. There is more an more info on mobile computing. Others are listed on the PowerPoint (which I will try to add as a link). Now the question and answer session is going on, but I am going to post anyway. First presenter was David Polodna (Winding Rivers): Certification in Wisconsin started in the 1920s. In 1965, state library re-organized, and certification went to DPI. In 1975, expiration dates for certification and renewal required continuing education. In 1980 Certification Manual was published. In 1985, new higher level added, and limited to directors. In 1995 new ranges of population established. Changes since, refinements. Panel: Where do the Standards help in providing good public service? Excellent libraries and staff in the state. There are areas where we do well, and others where we need improvement. ILL is one area of excellence (including delivery), support of intellectual freedom is also high. Discussion on certification and standards. Certification is one of the requirements to belong to a library system. The Standards are simply voluntary, and have no enforcement value. We have some fabulous people running very small libraries in Wisconsin. Many directors in small towns have lots of community connections. There was much discussion on the very small libraries in the state. Issues of community of identity, and funding. There was much discussion about professional versus non professional, salary levels, changing roles and job descriptions. One panelist reminded us that libraries expend 60-70% of the budget for salaries. Economic constraints should not drive the discussion of deprofessionalization of any position. There needs to be a Board and community commitment to library training. Discussion about job ads and include requirements for 2-3 years experience. How do Standards help? How will they help make sure we do well in the future? Provide a target for library development. Assist library boards to assess the quality of their own programs. Provide benchmarks and positive reinforcement for library activities. Ther may be too many categories in the Standards. For small libraries, the number of hours open helps a great deal. The program was more diffuse than I expected, but there were some interesting discussions. Lunch was an inspirational speech from Kevin Reilly, President of the University of Wisconsin system. After lunch I was part of the panel for WLTA entitled "Library and Community Involvement." After the break I attended the WLA Legislative update on state and federal issues. No predictions were made about when Wisconsin will have a state budget. Rick Grobschmidt did a great job on the budget issues. Paul Nelson covered the other state issues, and Jessica McPhail covered the the federal agenda. What follows is the Annual Business Meeting, and then the Annual Banquet and Awards. What is marketing? Any/all activities that help to facilitate and expedite exchange relationships. It is manipulation, but can be in a good way. Can't control the relationship. Factors for exchange: must have more than one entity; both entities must have something of value; both entities must be willing to give up their something of value; both must be able to communicate all of the above. What does this mean? What do we have to offer that is of value. Market segmentation: Who are your customers? What does your customer want? Have to be careful how to segment, you can cut the market too small. There is difference between mass and targeted marketing. Mass marketing has a lot of overkill. There are internal and external customers. Pay attention to trends. Social identity: classification based on demographic categories, social class and membership in organizations. Self concept: combination of personal identity and social identity. People participate in activities that improve their self-concept. Organizational membership helps define our self concept. What can your organization offer people, in various segments. People who are passionate about their organization forget that not everyone knows all about that organization. Perception of prestige increases members' feeling of identification. Has to be prestigious not elitist. Prestige is meant to imply that there is something of value. The extent to which offerings confirm what the member expects to receive, the higher the level of identification and therefore commitment. Frequency of appropriate contact with the organization will increase member identification. Participation with similar organizations decreased the depth of identification with any single organization. Level of education impacts identification negatively. More highly educated people tend to be involved in more activities and organizations. Free is not the reason people become members. Intangible factors like enhancement of self concepts and identification with the organization's mission, are primary reasons for identification. A strong and visible mission statement is important. Keep it where people can see it often. Increased contact must occur to increase identification. Projecting an image of prestige without being elitist is critical to fostering identification and affiliation. Ask both your users and non-users. Could use the University to do a survey at a lower cost. Can tout openness and friendliness, which builds prestige. Reality is that getting people involved is harder than most people understand. The theory of publics states that communication behaviors can be best understood by measuring how they perceive situations which have organizational consequences. Only 7% of the general population will ever become an active member of a non-profit organization. [Based on survey, on campus, over 10 years.] Those 7% will do everything for you. Need to pay special attention to this. It is a group which is literally dying. Need to think about how to position the organization and have a strong mission statement. Can't take anyone for granted any more. People will often stick more with the organization which has built a personal relationship. Solicit ideas from volunteers, even if you may not be able to do everything. Build affinity. Effective communication creates awareness by the relevance of the material to the person. Latent readiness is subconscious and developed through experience. Each time they hear about the organization they make a positive or negative association. Knowledge of what an individual has to lose if the organization does not have their support can build latent readiness. Triggering events provide an opportunity to act. It is essential to solicit feedback. Each time you communicate, decide what the intended results, and figure out how to measure the success. Must constantly adapt and change based on changing needs. Feedback is the way to figure out what people want and need. What do we say to our user, what makes an effective message? Establish a "marketing board" and ask for advice. Dynamic interactive talk, used PowerPoint very well, as the launching point for his talk. I was reviewing and editing and noticed that this is post #260. Krista Ross did a great presentation on the Wisconsin Open meeting laws. She originally did it for her library system's board of directors. The open meetings law creates a presumption that meetings of governmental bodies must be held inopen session. The Open Meetings law applies when there is a purpose to engage in governmental business (including discussion, decision or information gathering on matters within its realm of authority) and the number of members present is sufficient to determine the governmental body’s course of action (i.e., you have a quorum). The two most basic requirements are to give advance public notice of each of its meetings, and conduct all of its business in open session, unless an exemption to the open session requirement applies. The official newspaper, designated pursuant to state statute, or if none exists, to a news medium likely to give notice in the area. subject matter designations such as “miscellaneous business” or “agenda revisions” or “such matters as are authorized by law” as a way to raise any subject. Accessibility: A meeting should be held in a place reasonably accessible to members of the public and open to all citizens at all times,preferably in a public place such as a municipal hall or school, rather than on private premises. Tape Recording and Videotaping: Citizens have the right to attend and observe meetings that are held in open session. They also have the right to tape or videotape open session meetings as long it does not disrupt the meeting. Citizen Participation: The law does not grant citizens the right to participate in the meeting. The governmental body itself is free to determine whether to allow citizen participation at its meetings and may limit the degree to which citizens participate. Minutes of meetings and records of votes: Requires that a governmental body keep a record of the motions and roll call votes at each meeting of the body. Notice must indicate the subject of the closed session. If vote unanimous, do not need a roll call. Must announce in open session the nature of the closed session. All voting should be in open session, unless doing so would compromise the need for the closed session. Should have minutes of closed session which become public after the issue is resolved. If you do not re-open in open session, you cannot meet or do any business for at least 12 hours. Enforcement: Attorney General and the District Attorney have authority. Penalty: any member of the body who "knowingly" attends; fine is $25 to $300 for each violation. Can go into closed session, without advance notice, but only for an item which is already on the agenda, but cannot come back into open session. If you put times on the length of closed session or on agenda it will limit the length of the session. Marsha Valance from the Regional Library for the Blind and Physically Handicapped talked about the new device for blind readers. The new device will begin arriving in mid-2008 for digital talking book machine. Priority is for veterans, centenarians, and students. It will be 2012 before everyone gets the new hardware. They will maintain cassettes as a format until 2012. The hardware is 2/3 the size as cassette player. The digital device is about the same size as a cassette with whole in one end to both distinguish end, and for the device to be removed from machine. It weighs only 2 pounds compared to the current 7 pounds. The battery life is now up to 23 hours. You can place up to 1,000 bookmarks. If you push a button on the machine, and nothing is in the machine, it will tell you what that button does. They are not using the MP3 format, instead they use AMR-WB+. An entire book will fit on a single chip. There will be no more flipping sides. A VictorReader Stream will play NLS digital talking books, and content can be downloaded. A VictorReader Stream costs about $300. IT is sold by HumanWare. Must join the Library for the Blind. Can sign in to download. User name is the person's email address. Contact by phone (800/242.8822) or email lbph@milwaukee.gov. You can also visit the web site. The presenter talked about other items available widely on the web. These include Overdrive, Playaways, Baen Free Library, Guttenburg. She also covered the Web Accessibility Initiative. and Section 508. The web site for the Library has a great page of links for blind readers. Ulrikr Dieterle who is a health sciences librarian is doing a great presentation on gaming and what we need to know. Right now she is talking about the demographics of gamers. I will later add a link to her presentation on the WLA web site -- she notes that it will be there. She notes that some of the first simulators include "Rescu-Annie" used to teach CPR and flight simulators for pilots and astronauts. She has talked about the early games like "Sims" which date from the 1980s and ran on DOS. The military is the largest producer of games in the US. An interesting presentation and introduction. She presented a good reason for using games as part of the educational process, with many specific examples from the health area. Teaches Research Methods, the room was very, very full (about 45-50). He noted that UIUC also does library research (part of where he learned about surveying), for a fee, as will other consultants. He promised to also talk about the way research reports are reflected in the media. Below is a rough transcription of his presentation with some additional notes. Library Surveys usually are to assist in the planning process: identify needs, perceptions of what libraries are and should be, etc. Today was the beginning of the WLA Annual Conference. I'll blog what I can. For the opening session I could not blog live (there was access, but I did not yet have the password). I do now, and these notes are adapted from what I typed in Word and pasted here. It is not all complete sentences....be forewarned. The keynote was delivered by David Maraniss. He is a writer from a Madison family and grew up in Madison. He was a writer for the Washington Post and won a Pulitzer Prize in 1993 for articles on Bill Clinton, he has been a finalist at other other times. He notes that he used to start speeches with his connections to librarians, including aunt, uncle, cousin, and sister (Jean Alexander). He said that he has stopped doing that after hearing his sister come back to his home after a DC conference. A writer’s life is incredibly boring, about 50-60% is just sitting in a chair writing. He has spent thousands of hours in libraries doing research. Started on Clinton when elected. Living in Austin, found Oxonian, an obscure journal for alumni at UT, and found class notes written by Bob Reich (later Secretary of Labor. Also found 1972 Texas campaign info (Clinton was Texas co-chair) on meeting between McGovern and LBJ at LBJ Presidential Library. To do the Clinton book, spent time in Arkansas. First day in Hope (Ark) found that half the people claimed to be related to Bill. Motel clerk was great-aunt, invited over to house. Had boxes in attic, effects of grandmother on his mother’s side. Included stash of letters from Georgetown U (1964-68) written to grandmother, also a diary. At University of Arkansas in Little Rock were papers including papers from Fulbright and his last senatorial campaign. Documents from 1974 campaign for Congress. Hard to find governor documents. Kennedy Library is the tightest and of all the Presidential Libraries, Gerald Ford was the most open. Moved to Green Bay for 4 months in the winter to work on bio of Lombardi. Deeply Catholic person. Trained by the Jesuits at Fordham. Needed to spend time at Brown County Library. Always go there, is a cardinal rule. Needed to live here to write the chapter on the “Ice Bowl.” Local paper did an article which included phone number. Got lots of calls. Some resulted in contacts that would not have been made otherwise. Fordham Library was incredibly valuable born Sheepshead Bay, lived in Brooklyn, coached in high school, assistant at Army, assistant for NY Giants. Turned legend on its head: big city kid goes to little town. One of “Seven Blocks of Granite.” Fordham has the actual scrap books from that era. Writers who covered Fordham in that era were Damon Runyon and Grantland Rice. Protest at UW, and then battle in Vietnam. In 1967, first major war protest which resulted in violence. Asked at Washington Post morgue what was going on in Vietnam that day. Found very small story, where battalion on search and destroy mission where 60 killed, 60 wounded of 140 men. Among those killed was Terry Allen (son of a WWII general), Don Howlett(?) (football player recruited to Army by Lombardi). Then went to LBJ Library to read minutes of meetings LBJ attended. At the very moment of the Vietnam battle Johnson turned to McNamara and asked “How are we ever going to win?” [silent moment.] Also in LBJ archives are the reports from the situation room. It was lied about and presented as a US victory. Also was note from Joe Califano (an aide) about the Madison protest. State Historical Society has the best collections of alternative newspapers in the world. In danger, and archivist just retired, partly in frustration. Also have archive of other materials including a collection on the San Francisco mime troupe which led the students up the hill. Also, military historians keep very good records. Carlisle PA. Fort McNair found the most important. Interviewed all the survivors could find. Can’t always trust memories. Can trust miniscule, but important details. The rest of chronology can be in error. Military investigation done two-three days after including tape recording of survivors. Wrote report, buried by authorities. Wheaton IL archive operated by Col. McCormack. Includes all the medal winners from 1st Infantry Division. Found papers on commander (general) getting silver star. Papers of Branch Rickey are in LoC. After Brooklyn (Dodgers), went to Pittsburg where he got Roberto Clemente. Had male secretary who took notes as Branch Rickey talked at baseball games. Clemente died en route to Nicaragua after a devastating earthquake. Found in National Archives and found State Department papers. Looked at relationship with Samoza government. Nixon concern that there not be a revolution, and good health of Howard Hughes. Clemente tried to get aid because he had been there a few weeks before with a Puerto Rican team. Lombardi trove from son – water logged boxes. Clemente book – lawsuit on the plane crash. All the legal documents were missing. Finally found a lawyer in DC who had three cardboard boxes of documents including depositions about the suit. Next book, coming out next year: World changing in 1960 with the Olympics: race, cold war, women sports (Wilma Rudolph), television, doping scandal, etc. Began right after Gary Powers spy trial. First black African got gold medal as African nations began independence. East and West Germany competed on a combined team. This time able to ask, “How would you like to go to Rome?” Then went to Lausanne Switzerland to Olympic headquarters and archive. Owe all librarians a debt of gratitude. The last weekend in September, I was back in Connecticut to visit my mother. She lives in the northeast corner of the state. It was when I went to bed, that I realized how dark it was there. I began to think about dark, and the qualities of darkness. I have lived most of my life in larger, more urban areas. In most places I have lived, when the lights go off at night, there is still a fair amount of light. It comes from the street lights (or currently a parking lot light). Almost always there is at least a glowing clock in the room. However, my mother lives in Connecticut's "Quiet Corner," and I don't think there is even a street light in her neighborhood. Her house is shaded, and the bed room faces west. I haven't checked the phase of the moon, but I am thinking it was probably close to new moon (dark). I turned out the light, and found myself in complete darkness -- it seemed as completely dark as in a photographic darkroom! It was unnerving at first. Normally, when I wake up at night -- even in the days when I was camping, and in the wilderness -- there is enough ambient light to at least see outlines of nearby objects. Here, there was not even that very small amount of light. I found it disconcerting. In my undergraduate studies (Religious Studies at Brown University), there was much discussion of the theme of light and dark in the writings of the Early Fathers of the Church. Was this a realization of some deeper issues? I'm not sure. I don't feel a "darkness in my soul" currently. As a matter of fact I am pretty content. That is why I can wax philosophical. I guess that I am feeling a little like Steve Oberg (Family Man Librarian) having read a new book by someone I have met here in Eau Claire. Maureen Mack is a professor at UWEC (University of Wisconsin - Eau Claire), and teaches in the education department. In that respect this post veers from the professional (just a little) into the more personal and advocacy. Her book is Finding Center: Strategies to Build Strong Girls and Women. It is published by New Horizon Press in Far Hills NJ. The book is an interesting mix of analysis of research, personal stories, and checklists/tests which will allow parents to create a better world for women. As someone who is a parent to both young men and a young woman, I learned some things I wish I had done differently. I also read about what I did correctly. Much of what Dr. Mack has written is aimed at helping us to build successful, confident women who will, ultimately, determine our society' s direction. Those who are parenting young women must read this book. There are numerous suggestions about how to help girls develop into the confident women we need. It is sometimes incidental that the book talks about how to help our sons become the kind of people who value women, respect women, and support women. I work in a profession which has many more women than men. My inspirations for becoming a librarian were influential women in my life. I feel that I have a duty to pay back that inspiration. At the same time, I am the father of two sons and a daughter. The two sons have finished college and are now beginning their careers. To me, they seem to have successful lives and successful relationships. My daughter is still in college, and to me, still a work in progress. However, she is completing a double major at a large, major university. She seems to be on a good path professionally and personally. At the same time, when I pause to reflect, there are things I wish I had done differently. There are times I can point to when I wish I had spent more time with each of my children [I just can't call them kids -- i.e. young goats]. They have turned into great adults with the help of both parents, and at times I think, in spite of both parents. Having read this book, there are things I would do differently if given the chance. In a way, that is my pledge. Bottom line: if your library does not have this book, buy it. Read this book! !